No sweat reaching this button if the light refuses to change. Next time the Albany Bicycle and Pedestrian Commission is looking for some project, it might want to consider the fact that many modern traffic signals ignore people on bikes. Some communities have solved the problem with gizmos like the one in the photo, a bike-crossing button similar to those routinely provided for people on foot. At signals activated by cars above a loop in the pavement, the lights typically don’t change unless a vehicle is on hand, waiting. In the absence of vehicles, the smaller loop built into the bike lane often fails to cause the light to change, no matter how energetically or far the cyclist leans his bike. The answer is to wait until a vehicle shows up to trip the sensor, which during certain times on some city streets can be a long time, or to run the light. Why not just walk over and hit the button provided for pedestrians? 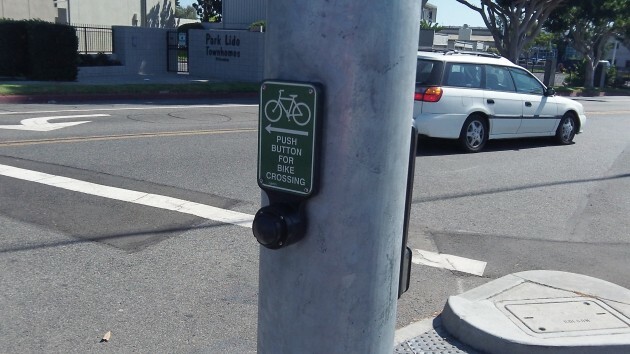 Because typically the button is mounted some distance away from the bike lane, and by the time you get back to the road from pushing the button and mount up, chances are the light has turned red again. So you look right and left and behind, make sure no cop is in sight, and run the light as soon as traffic on the cross street offers a big enough gap. Or, as they did here in Minnesota, change the law so it is legal for a bike to proceed against a red light when it is safe. Wow, people making decisions for themselves without the government telling them when it’s safe! What a concept! This is actually something motorcycle riders have been advocating for many years. Motorcycles often don’t (or can’t) trip the sensor that changes the light. If they obey the law, they may have to wait until a car trips it for them. Hub City ABATE (a local motorcycle advocacy group) has lobbied to get this changed at a state level. It’s called the “dead light” law. As a motorcycle rider myself, it’s a common sense law that would help a lot of people. Think about pushing a coded laser signal from your cell toward a Traffic light. Fail In heavy rain or fog. Money to be made too. Or get the light or pole to take picture. A calculator has enough cycles to tell if there is a new something in the image. I’m not sure what the problem is? Ron Irish assured me all the bicycle sensors work fine! About the only time they seem to work for me is when a car stops next to me.